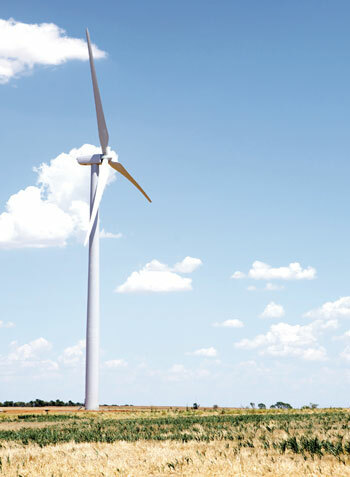 Oklahoma's new 235-MW Chisholm View wind project-the largest single-phase wind project in the state-definitely had challenges including transporting low-cost renewable wind energy across three transmission systems. But that Oklahoma-generated wind power is now being used in thousands of homes in Alabama. In 1893, Oklahoma held the largest land run in U.S. history. More than 100,000 people poured into Oklahoma to stake their claims and harness the land's natural resources. Many of those farmers erected windmills to pump water for farms and ranches, and later, to generate electricity for their homes. Over a hundred years later, it's not pioneers who are pouring into Oklahoma, but wind companies who are coming in and staking claims. They are harnessing the natural resource, creating power, and providing additional revenue for farmers and communities. 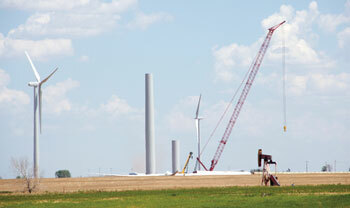 Those companies include TradeWind Energy, which recently completed a 235-MW wind project in the state. 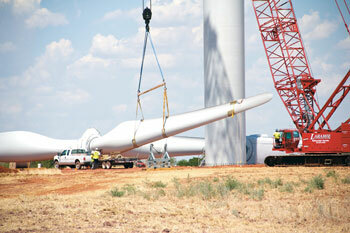 "In 2007 TradeWind began scouring Oklahoma for optimal wind sites," said Joe Arb, project developer for TradeWind Energy. "We were looking to greenfield a site that had all the major components-a strong wind resource, a robust transmission network, and few environmental issues. And while there was a lot of activity occurring in western Oklahoma, we thought there were certain parts of the state that had great potential, were extremely well suited for wind, and were currently undeveloped." When TradeWind found the location they were looking for in north-central Oklahoma, they hit the ground running. The four-year-plus development of the Chisholm View wind project included community outreach, land leasing, permitting and environmental research, obtaining permits, performing field surveys, and collecting meteorological data. One challenge with Chisholm View was that despite being in a sparsely populated area, more than one hundred landowners were involved in the project site. For TradeWind, community outreach and landowner relations are of utmost importance. Because wind was new to the area, they began first with education about wind energy and what it involved. Once the landowners and community understood what was ahead, the focus was to assure the landowners that they could continue developing onsite resources. "This is wheat country," says Arb. "As long as the landowners could continue to grow wheat and continue to explore for oil and gas, then they were happy. And we were able to ensure that all of that could still go on uninhibited." Working with numerous landowners turned out to be a positive experience on both sides. It helped increase the acceptance of the project from the entire community. "Instead of having a single landowner that benefitted from the wind project, Chisholm View had more than a hundred people that at some level benefited as landowners," adds Arb. Just as pioneers had to cross rivers and canyons to reach their claims, TradeWind Energy had to find a way to cross multiple transmission systems to make the Chisholm View Wind Project viable. Normally, acquiring a transmission path to export the power to the utility-in this case the offtaker was the Alabama Power Company-wouldn't be too difficult. At Chisholm View, however, it required crossing three transmission systems with separate tariffs. Geoff Coventry, CEO of TradeWind Energy, explains the hurdle of obtaining the rights to interconnect the project. "The project located in Oklahoma is part of the Southwest Power Pool, which is the regional transmission system that serves a five state area. To get to Alabama, we had to go across that system and then across a neighboring system, which at the time was the Energy transmission system-which spans four states, 114,000 square miles, and six regulatory jurisdictions-which has a different transmission system in terms of operation and rights needed to get service across it. Next we had to get to Alabama, which was a whole other transmission system. It was definitely a challenge, but one that worked out very well." The $375 million Chisholm View wind farm has 140 GE 1.68 megawatt turbines, for a total nameplate capacity of 235 megawatts-enough energy to power 80,000 homes and replace about 520,000 tons of carbon dioxide emissions. One would think that the costs involved in moving power these distances would make the project cost prohibitive, but that wasn't the case. This was the first project to "really open up the southeast as a potential market for this very rich, renewable resource we have in the plains area," says Coventry. "Conventional wisdom said you couldn't move power that far and certainly not of the volume we were talking. And maybe we just weren't smart enough to know you couldn't do it. But we tried and found a way to obtain the service on all of these systems and get the price of the power-including all that delivery cost-to still be affordable. In fact, Alabama Power is being quoted as saying that it's going to save their ratepayers money." The wind farm went up in 2012 at a cost of $375 million. One hundred and forty GE 1.68 megawatt turbines were used, for a total nameplate capacity of 235 megawatts-enough energy to power about 80,000 homes and replace about 520,000 tons of carbon dioxide emissions. The site was close to ideal and construction went smoothly, says Arb. Chisholm View is situated on rolling hilltops, and TradeWind was able to spread the array in an east/west direction to minimize the wake impacts that one row of turbines will have on another, says Arb. Also, the soils are well suited for turbine foundations, and none required significant over-excavation. In addition, the rural area already had a strong network of state and county roads. "But like most sites, once you're off the blacktop, the grid roads of dirt and gravel needed significant upgrades to handle the construction. We did spend millions on enhancing the local transportation system there," says Arb. Mortenson Construction was the EPC contractor and provided the final engineering, procurement, and construction for the site. TradeWind has worked with Mortenson on previous projects, "so there was a comfort level with their procedures," says Arb. "Working on a project as big as Chisholm, with hundreds of people involved, it's very important that the relationship is strong and the parties are talking to each other and communicating well. Expectations need to be very clear in terms of what's being built, how it's being built, and that proper precautions are being taken for safety. It's been a good relationship." On the civilian side, many people were hired to assist with the construction, from trucks delivering concrete, to local fencers and rock companies. And the site isn't far from the Vance Air Force Base, a critical community member around the nearby city of Enid. "We've had a very successful relationship with them via early and often communication, partially with the help of Brent Kisling and the Enid Regional Development Alliance. We were able to ensure that it wasn't a challenge, but rather just a relationship that we fostered," says Arb. At the time of construction, Chisholm View was the largest single-phase wind project built in Oklahoma and still remains one of the largest projects in Oklahoma. The project was completed at the end of 2012 and began producing power in December. The Alabama Power Company is pleased with the production, but the community around the project is also pleased with the added revenue. The local community is receiving an estimated $5 million annually through taxes and leases. "At the time the project was constructed, I believe it was going to be the largest taxpayer in Garfield County," says Arb. "This is a significant statement given the city of Enid is entirely in Garfield County, which has a population of approximately 50,000." From the start, TradeWind Energy, has demonstrated that pioneer vision of untapped opportunities. "Southern Company was really on nobody's radar in terms of a buyer of renewable energy or really dominating the southeast," says Coventry. "They weren't perceived as an entity that would have a lot of resources available to them, and it would be very difficult to get the remote resources to them. Alabama, we thought we could find a way to do this. It probably took a year working through all of the transmission tariffs one by one and working on the contract with the customer. But it was a great relationship, the way both parties were motivated to find a way to make it work and stay together." Expect to see more TradeWind projects springing up as they continue that pioneer spirit. They are actively developing projects in 15 states, totaling around 4,000 megawatts. They are also beginning to diversify and expand into large utility-scale solar development through the central and southeastern U.S.
"A lot of businesses just sell a product and that's their customer," says Coventry. "For us, our customers are the landowners that we work with and the communities that we develop in, as well as the utilities that buy our power and the people that depend on them. So we have a very unique set of relationships, and that's very, very important in our business. We treat every one of those relationships with a high degree of respect and really cooperate with meeting their needs. I think this project really exemplifies that right across the board."